Frank Martin was a Swiss composer whose first language was French. His major choral works include this piece, In Terra Pax, Requiem (also recorded on Jecklin), Golgotha and a substantial set of Rilke songs. Frank Martin's notes with this set indicate that in 1938 when he was approached to write a piece of circa half an hour duration for chorus he had been much taken with Charles Morgan's novel 'Sparkenbroke'. This refers to, and is imbued with the spirit of, the Tristan story. Robert Blum whose commission the choral piece was also agreed to Martin adding seven or eight instrumental parts. These are pairs of violins, violas, cellos, a double bass and a piano. 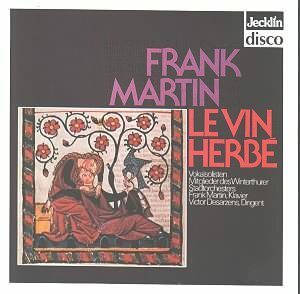 So was born Part I of Martin's Le Vin Herbé (the drugged wine). After the premiere of Part I Martin added two more parts to round out and complete the tale. On this CD (rather capaciously accommodated in an old style twin CD 'coffret') the first disc carries Parts 1 (6 tableaux) and 2 (5 tableaux). The third part (7 tableaux) (42 mins) and the 2.41 Epilogue comes on the second CD. While the forces are not fully orchestral and cannot even claim to be a chamber orchestra the effect is quasi-orchestral. The singers, singing as a chorus, play a largely declamatory narrative role. The music has a touch of Les Noces about it. The music is heavy on dynamism and a certain monumental muscularity but light on colour and short on ecstasy. The dark-tone of the male singers is quite commanding in a monochrome and monolithic way. Tableau 5 suggests chaos in a rushing piano part and urgently propulsive strings. That urgency is mixed with tempered passion and a harsh march. Over the foundation-solid voices of the choir a female voice rises in resolute stoicism defying an apocalyptic chaos. The second part is all desolation, intensity, little passion and urgent impulse. Some of the etiolated dreaminess of Debussy's Pelléas et Mélisande is also evident. There is imaginative string writing but all in charcoal and white light. Remarkable in Part 3 is the honey-glazed tone of the strings (CD2 track 2 1.55) and the bubbling piano dreamworld of Tableau 4. There is a sense of hearing a landscape in convulsion through the most vivid playing by the instrumental ensemble at 4.12 in track 3. In the sixth tableau Martin achieves a static monolithic effect with the solo violin crying out in concentrated soulfulness. The text is given in French and English side by side in the case of the sung words. The notes are by the composer and appear in the original French and in English translation. This work represents a sombrely intense experience. You will know if this work is for you. It is not at all a pinnacle of melodic emotionalism and you might have expected more passion from the story. It represents rather a book of woodprints with the pages turned as the story and the roles unfold in singing. It is beautifully done and is clearly authentic carrying the composer's imprimatur.